The whale shark is one of the most majestic creatures in the world. Mysterious and unique, this elusive creature of the sea has many astonishing characteristics, most of which I will discuss in this short essay. I hope I can convince you to love the whale shark as much as I do by the end of it. Whale Sharks are gracious and incomprehensible creatures; they glide through the waters with calmness and never fail to amaze in their sheer majesty. Contrary to common belief, the whale shark is not technically a whale, but the largest fish in the sea. It is only called a whale because it looks like one. Its scientific name is Rhincodon Typus. It is a carnivore, and some say its lifespan is around 70 years, but this is debatable, as depending on the source, some scientists say they can live up to 100 years. There is an overall consensus that these fish live for a very long time, and have many years to develop and grow. The whale shark is about the size of a bus, measuring in at between 18 and 32 ft (5-9 meters) long, and weighing 20 tons. Just imagine swimming with something of the same magnitude as a bus. Furthermore, some whale sharks have reached striking lengths of up to and beyond 40 ft (12 meters), with the highest recorded length being 60 ft (18 meters). This allows us to understand, why, in the past, sailors were terrified of “sea monsters”. In days of old, if anyone had seen a fish with the sheer size of a whale shark, they would have been petrified. However, the good news is that they do not eat humans, preferring plankton to flesh. They are also docile creatures and it is also a popular tourist activity to swim with them, as they only swim at circa 5 km/h. The whale shark is a filter feeder, which means that it ingests plankton by opening its gargantuan mouth while swimming. The width of the shark can reach 1.5 meters. This leaves a lot of room to take in anything and everything in its path, from plankton to small fish. This is a passive process and is officially known as ‘cross flow filtration’. Mature whale sharks have around 300 rows of teeth, with 3,000 teeth in total. It is also viviparous, this means that embryos develop inside egg cases, but hatch in the uterus. Whale sharks sometimes carry whole ecosystems around with them. They generally live in tropical waters, and tend to stay in relatively deep waters, though they occasionally visit coral reefs near the shore, and travel around the world. They have been tagged by GPS trackers to monitor where and how far they travel. One fish traveled 13,000 km in 3 years! To put this into context, it is as if the whale shark had swum from the north pole, to the south pole. They migrate to regions with high levels of plankton, their primary food source. Some places they frequently visit are Australia, the Philippines, and Mozambique. Tanzania’s mafia island has a large school, or group, of whale sharks that reside there for most of the year. This year, there have even been some sightings of them off the coast of New York city. Currently, these fish fall under the category of being a vulnerable species, according to WWF, though it is important to note that it is hard to accurately measure their numbers, since there is very little available information related to their population. As with so many other animals, the trend is that their population is decreasing rapidly, meaning their numbers are continually dropping. The global population is estimated to be in the thousands, though some scientists state that the conservation status of the animals is unknown, but they have noted a drop in the size and the number of fish. Additionally, the number of sexually mature whale sharks is on the decline, most scientists agree. Sadly, the killing of whale sharks remains a lucrative, yet illegal practice. The whale shark has no natural predator, and is thus vulnerable to human attack. This is another eye-opening example of how humans fail to live in harmony with their environment, and to respect the creatures that we share the world with. Although whale sharks are protected by international laws, such as the Convention on International Trade in Endangered Species, and the Convention for Migratory Species, and the illegal market for whale sharks continues to grow, since a single carcass is worth $30,000 on the black market. The whale shark is hunted mainly for the oil in their livers, which is believed to have medicinal purposes and to waterproof wooden boats. Further, Shark finning, the process of cutting the fin off the living creature, thus leaving the animal to die in the sea, is extremely common. Shark fins are a delicacy in many areas of Asia. Therefore the large fin and amount of meat the whale shark provides makes it a target to fishermen. Bycatch, the process by which whale sharks are accidentally trapped in fishnets, is another cause of death. This is especially prevalent in Asia, and it remains common practice. A petition in china states “Chinese fishermen kill an average of 600 whale sharks per year.” This was only in a single slaughterhouse in Wenzhou, in Southeast China. Most shockingly, most of the slaughterers face no legal action, as the authorities let “animal abuse, and the illegal slaughter of animals go unpunished”, WildLifeRisk, a Chinese non-governmental organisation, revealed. On the other hand, in West Papua, Indonesia, the whale shark is considered a good luck charm, and fishermen love to keep them near by. However, whale sharks also have many sanctuaries in the form places that used to hunt them, but now live in harmony with them. Those sanctuaries still make money with them but in a way that is beneficial to the humans and not harmful to the fish either, called ecotourism. Divers from all over the world would do anything to dive with these docile giants. Ecotourism is a good way to raise awareness about these creatures. 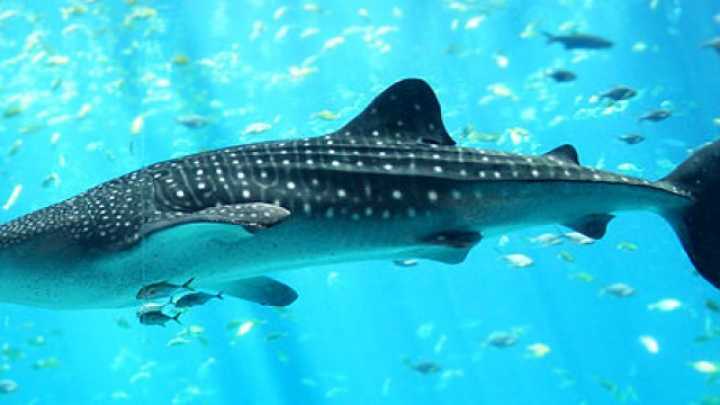 However, skeptics say that the humans interfere too much with the whale sharks development, and that the boating activities around the whale shark will have negative effects on it. These are valid concerns, though as long as the tour guides make sure the fish are not harmed, I would consider diving peacefully with them better than slaughtering them for their meat, and am thus, personally, an advocate for ecotourism. If you ever get the opportunity to dive or swim with a whale shark, take it. I’m sure it will be an unforgettable experience! The views and opinions expressed in this article are those of the author(s) and are not necessarily endorsed by The Update. We encourage anyone who would like to send an opinion piece to sign up in the join us section of the website. Posted in Opinion, Uncategorized and tagged #endangeredspecies, #ocean, #whaleshark. Bookmark the permalink.